Memories are funny things. Sometimes we have them handy and they come easily to us. And sometimes they store themselves away on some distant shelf way in the back of our minds only to be found when triggered by a completely random and unexpected source. It could be the smell of the top of an infant’s head. Or the taste of a special cookie made by a favourite Aunt. It could be a colour or the way something looks when the light hits it just right. It can even be the way something feels – the softness of a blanket or the stickiness of dandelion stems (remember trying to get that off your hands!?). Well the other day I had the pleasure of having a very old memory brought to my attention quite unexpectedly. I was making French toast for our breakfast and decided to make some Sucre a Crème to pour over it (see recipe below). Once it was cooked, I poured the boiling hot syrup into a mason jar and covered it with a proper canning lid. 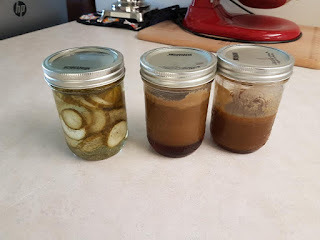 A short time later I heard a slight “pop” sound come from one of the jars and instantly I was reminded of the canning my Mom and I did when I was a youngster living at home. That popping sound meant that the hot syrup helped to seal the jar – and now it could be stored safely in the root cellar or cold room for a good long time. How many jars of peaches, tomatoes, pickles, jackfish, peas, carrots, potatoes, chickens, crab apples, pears, green beans, sauerkraut, eggs, strawberries, blueberries, Saskatoonberries, and jam did we can over the years?? Each year Mom and Dad would put in a “little” garden next to our house in town. The “big” garden was out at our Uncle’s farm. That’s where we grew a couple rows of potatoes (my guess is the rows were a half mile long each, but I might be mis-remembering that), as well as more peas, carrots, and other vegetables. Whatever we didn’t grow on our own – mostly fruit – we bought by the case in the fall when the trucks from BC would come to town. Mom and I would start each canning day the same way. We would prepare whatever food was going to be canned. That meant, shelling peas, shucking corn, snipping beans, mixing up brines for pickles or fish, peeling, pitting, slicing, cutting – all the things that made each thing even more delicious. Next would be sterilizing all the jars and lids. Sink after sink filled with glass jars and new lids with seals. Once the jars were ready we would fill each up with whatever was on the menu for the day. Green beans placed lengthwise into the jars all standing uniformly waiting their mission. We’d top up the jar with brine or water and a bit of salt of sugar, add the seal and lid on and place them in the canner and pressure cooker. The canner was easier to use, but the pressure cooker got the job done in half the time. I was always afraid of the pressure cooker, but Mom knew what she was doing, and I don’t recall ever having anything serious happen. Once the jars had cooked long enough on the stove, we took them out using a special wooden and wire grabber to pull them out of the pot and place the jars on the countertop. As the full jars sat on the counter cooling off, they would give a little popping sound letting us know that they had sealed properly. At the end of the canning season we always took a moment to go down into the root cellar (which was located under the stairway leading to the basement), to see the fruits (and vegetables) of our labours. It was truly satisfying to see the row upon row of jars filled with brightly coloured fruits, vegetables, and other delicious foods. I hadn’t thought about any of that for years, and all those memories – the smell of the vinegar for the brine, the taste of canned crab apples, the sound of the steam releasing from the pressure cooker, the feel of the hot soapy water when washing the jars, and the look of all those lovely jars of food on the shelves – all of that brought back to me by the simple pop of a seal on a jar of syrup. My but memories are wonderous things. Mix together in a saucepan and bring to a boil for 2 to 3 minutes. Serve warm as a wonderful syrup for pancakes or French toast. Use cold as a spread on toast or drizzled over ice cream (or just eat it straight from the jar – I won’t tell if you don’t!). This will keep nicely in the fridge for ages and can be microwaved over and over. I store mine in a mason jar with a lid – that way I can just pop the jar (without the lid) into the microwave to heat it up. Posted by my lovely wife Angelle. In the late seventies (yes, the 1970s) I was enrolled in an Electronics Engineering Technology program. There was some minor programming involved. I had to write my first program on ticker tape but I loved it right away. I could write some code and then watch the machines do what I asked them to do. It was just awesome. The school had some minor games on the central computer. One of them was a space game. No one had personal computers at the time so this was brand new to me. Just picture yourself at 23 years old being able to play your first computer game. It was mesmerizing. We did not have terminals, just teletype machines, so each move we made in the game had to be printed out. It took a lot of paper. And now we see the problem. The school shut down the computer games because of all the paper use. It was a sad, dark time indeed. I like to try many different things. I guess one of my biggest fears in life is that there may be something somewhere that I have not experienced. So in keeping with that thought I once took up skiing. Now this story is really not about me or even that much about skiing so feel free to skip to the next paragraph. When I did learn to ski I took lessons and practiced on small hills in the city. It was 15 minutes up the hill and 30 seconds down. It took a long time to get little practice. After a while I was ready for the mountains and what I found was that it was half an hour up and half an hour down. I learned more about skiing on my first trip down the hill in the mountains than my entire practice time in the city. Who knew? Well... I guess every skier except for me and the people who told me to learn how to ski in the city. Have someone else take care of saving money for you. Go on and live your life… be a solid citizen… party your brains out… divorce… marry ten times… be a politician… be homeless… be rich… do whatever you want to do or can do with your life.During your life you will have savings to help you do all, or any, of the above. You may even save some money for later in life… like next week. If you have a job your company may have a savings plan.The way it usually works is that the company will take the money right from your pay without you ever seeing it and put it in a savings plan.Many companies will contribute some of their own money.You just got a raise.You are getting more money without doing a thing. First a little about myself. I am an independant game programmer living on a small island attached to Vancouver Island. I am writing a blog mainly because I have stuff inside me that wants to get out. That would be the stuff that you read on my blog. Why "notabandwagon"? I like think before I do things and I don't ever want anyone to follow me without thinking about it first. If you find something of use in what I say then that is great but it is important to me that you make up your own mind. Don't jump on my band wagon just because it is going by. What about Happy, Healthy, Wealthy? My number one goal in life is to be happy and to help as many others as possible happy. I don't mean every second. I speak in general rules and not in absolutes. Being healthy or wealthy and not happy both sound like a bad situation. My number two goal in life is to be healthy. Wealth without health again sounds like a bad situation. Third is of course wealthy. Wealth can be about so much more than money. So there you have it. The three big things in life Happy, Healthy, Wealthy in that order.